With three days in Auckland, there’s enough time to explore the city and harbors, amp up the adventure level with a choice of gravity-defying activities, and take an excursion to cultural and scenic destinations not far from the City of Sails. Here’s how to maximize a 3-day trip to this world-class metropolis on New Zealand’s North Island. Discover the vibrant city of Auckland on a hop-on-hop-off bus tour and get acquainted with the highlights at your own pace. Visit Mt. Eden, browse the Parnell Village boutiques, ascend the Sky Tower, and stroll around Auckland Domain, the city’s oldest park. Alternatively, opt for an aerial sightseeing tour by seaplane or helicopter, with guided narration about significant landmarks like the Auckland Harbour Bridge. You can also experience the city with a Maori guide and catch a cultural performance at the Auckland Museum. A must-do for families is a visit to Kelly Tarlton’s Antarctic Encounter and Underwater World for a look at New Zealand wildlife. Once you’ve got the lay of the land, embark on a scenic harbor lunch or dinner cruise and take in spectacular views aboard a catamaran or sailing yacht. Alternatively, Waiheke Island, located in the Hauraki Gulf, is a popular destination for food and wine tours. A proper New Zealand vacation requires at least one day in the great outdoors. A favorite family-friendly activity is whale-watching and dolphin-spotting in Hauraki Gulf Marine Park. You could also spend the entire day on the island of Tiritiri Matangi, a predator-free bird sanctuary, ideal for nature enthusiasts—take the ferry over, and then hike at your leisure or opt for a guided walk. If an adrenaline rush is more your style, go straight to the top with the Auckland Harbour Bridge climb—the 360-degree views of the city are magnificent—or for even more of a thrill, take the plunge on a breathtaking bridge bungee jump. Sailing enthusiasts can join the crew of an actual America’s Cup yacht and try their hand at match racing. Yet another option is a jet boat ride on Waitemata Harbour, which spins you past the Sky Tower and other top city landmarks. Subtropical islands, glowworm caves, historic sites, and pristine shoreline—there’s a lot within an easy day trip’s reach from Auckland. Head to Northland and cruise around the gorgeous Bay of Islands to the Hole in the Rock and back past Cape Brett Lighthouse. Or ferry over to the charming township of Russell and tour the Waitangi Treaty Grounds. On the rugged West Coast, you can take an eco-walking tour in the rain forest of the Waitakere Ranges. Thermal sands and camera-worthy coves are found on the Coromandel Peninsula, another stunning alternative in the North Island’s great outdoors. Lord of the Rings fans will want to head south to Hobbiton, where the Shire movie set and Bilbo Baggins’ hobbit hole await. On the way, take an underground boat ride through the illuminated grotto of Waitomo Glowworm Caves; end your tour in Rotorua or back in Auckland. Auckland bridge bungy jumping is the ultimate thrill — an unforgettable New Zealand experience. 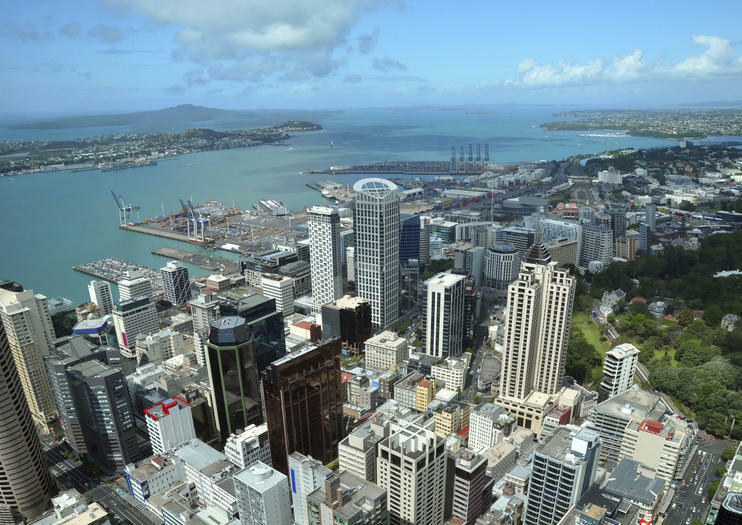 Suspended over Waitemata Harbour, you’ll leap from the Auckland Harbour Bridge. Take an exclusive bridge walk to the purpose-built Bungy Pod and feel the adrenaline as you plunge 131 feet (40 meters) toward the water. Just try to keep your eyes open so you can enjoy the views while airborne! Scale the Auckland Harbour Bridge, from its base to the summit, on a thrilling bridge climb. Clamber along custom-engineered catwalks on an easy walk with a professional guide, who points out the Sky Tower and other Auckland landmarks. Suit up in safety equipment and watch bungy jumpers plunge toward Waitemata Harbour. This experience includes round-trip coach transport from the Maritime Museum. Visit the Coromandel Peninsula — renowned for its idyllic beaches, rugged terrain and pristine rainforest — on this day trip from Auckland. You’ll ride a narrow gauge railway through a native kauri forest to a viewing platform where you’re rewarded with views over the Hauraki Gulf. Your professional guide takes you to Cathedral Cove and to soak in a thermal pool at Hot Water Beach. A cafe lunch plus round-trip hotel transport are included on this small-group tour, limited to nine people. Explore Auckland and its surroundings through the eyes of a Maori guide on this full-day tour that includes a cultural performance and lunch. Take a walk through the ancient forest of Tiriwa, discovering native flora and fauna and their significance to the indigenous Maori worldview. You’ll visit a beautiful west coast beach and learn about a rich cultural heritage as you watch the Haka dance performed at the Auckland Museum. This small-group tour is limited to a maximum of 15 participants for a personalized experience.